Astropost: Progressed Moon Out of Bounds: special periods? Progressed Moon Out of Bounds: special periods? Does the Out of Bounds declination of the progressed Moon signify a period of successes or is the OOB progressed Moon a risk? To answer this question I looked at the charts of Lance Armstrong, Dominique Strauss Kahn, Hillary Clinton, Donald Trump, JK Rowling and Jean-Marie le Pen. I came to the conclusion that the four years before reaching the highest degree, the progressed Out of Bounds Moon signals an exceptional period of growth (and alienation), while the first time after reaching the top position, there seems to be a danger of decay. When the progressed Moon was OOB and reaches the lowest position later, there is a period of drawing back (a pause). You can find the declinations of the Progressed Moon in the Special Charts of Astro.com (select Ebertin Life Diagram Progressed Declination). 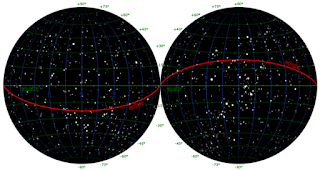 A position is Out of Bounds when it reaches a declination degree of 23° 26' 14.675″ (23° 26′ 16″) north of the Equator or 23° 26' 14.440 South. Lance Armstrong had a very successful period after his illness and later he lost it all…Progressions and transits cooperated with the declination of the progressed Moon. - In October of 1996 he found out that he had cancer. This was with progressed Moon on 14d36N, almost parallel Pluto. From that moment on the Moon moved to zero degrees in 1999. - The Moon moved upwards later, and in 2002 the progressed Moon was again parallel Pluto. - Between 2005 and 2008 there was a progressed OOB Moon S. In 2006/2007 the progressed Moon reached the highest level. That was when he quit biking and had had good years (think of Livestrong). In 2008 he had his comeback. - In 2012,when he was 40, the progressed Moon had again become parallel with Pluto and the ‘demasqué’ began. He lost all his titels. Apparently the Moon-Pluto parallel mirrors extreme experiences and the OOB Moon S mirror his best years (but, ….only for outsiders). If life would repeat itself, then from 2017 on better days are coming for Armstrong. In the 4 years before reaching the top level of the OOB Moon (2002-2006) he was popular, rich and happy as far as we could see. Dominique Strauss Kahn had a very high and powerful position between 2007 and 2011. The Moon moved ‘up’ since 2007. Between2009 and 2014 the progressed Moon was OOB. On the day of his arrest in 2011 the progressed Moon in the 6th degree of Cancer (28d8N) moved down again and right now, the progressed Moon is ‘in bounds’ again. Just like in the Lance Armstrong case, the 4 years before the top level of declination of the progressed Moon seem to the most prosperous of them all. Hillary Clinton wants to be the next president in 2016. That is when her progressed Moon is at a low degree of declination, South. During the Lewinsky affair, when she was First Lady, she had the OOB progressed Moon on a high degree South. 3x Jupiter, the planet of successes. So we will have to wait and see who wins: Jupiter or the declination of the progressed Moon. Donald Trump’s progressed Moon is OOB and will be over the top in November 2016. Some of his party members think he is over the top already:). Meanwhile, he is doing well in the polls. J.K. Rowling invented Harry Potter in 1990. In 1997, 4 years before the top level of the OOB progressed Moon, she found a publisher. (Note: don’t use the ASC and MC positions as this is a guess chart). Jean-Marie le Pen was thrown out of his own party now that the progressed Moon is close to zero degrees in declination. John F. Kennedy was murdered on November 22, 1963. That was when the progressed OOB Moon was not yet at the highest possible level, but in the 25th degree (he was born with a Moon in the 1ste degree N). So, he was in his best years when someone ended his life suddenly, with transit Uranus conjunct progressed Midheaven.
! Many VIPs never had an OOB Moon (like Bono, Bill Cosby, Cliff Richard) and ever so many unknown people DO have OOB Progressed Moons. Read the story of Kurt Cobain, who died only 4 months after the moment that the progressed OOB Moon reached a 27d48 top level. Progressed Moon OOB can represent a temporary top level that may be lost when the Moon goes on her way down again, especially when difficult aspects in the progressed chart, by transit or in the natal chart indicate this possibility. Every progressed OOB Moon seems to lift your social level with a number of risks. But don’t you worry: you can rise high and fall deep without an OOB Moon as wellJ! The progressed Moon OOB is one of more indications that it takes to mirror a special period and has to be considered with the circumstances and the natal and progressed chart in mind. The positive side of the progressed Moon OOB is the chance to reach above yourself and your situation. The negative side is alienation. The astronaut in space is a nice example of that. The progressed OOB Moon is not in control. John F. Kennedy died in the best years of his life. Maybe because he went ‘too far’ in the eyes of his enemies? And how about Jean-Marie le Pen’s zero degree Progressed Moon? Maybe that is food for the next post! Question: ever experienced an OOB Progressed Moon? And what happened? Feel free to share your examples. I have natal OOB Moon at 26N34, I checked all my previous 3 periods with progressed OOB Moon reaching to peak, all correspond to top level, success has been easier, where I was most contented at those moment, later followed by U-turn. All the periods of progressed Moon at 0 declination correspond to bottom in life or period of least vigour, followed with next phase of life. What is your observation of the difference, if any, of those having natal OOB Moon and those who haven’t, all going through progressed OOB Moon cycles? Thanks for your comment and question. I intend to continue the study of the OOB moon and will include your question as well as the q if there is a significant difference witj the inner progressed bound ups and downs. Many in the Russian press and in the international media warned that the death of some 130 hostages in the special forces' rescue operation during the 2002 Moscow theater hostage crisis would severely damage President Putin's popularity. However, shortly after the siege had ended, the Russian president was enjoying record public approval ratings – 83% of Russians declared themselves satisfied with Putin and his handling of the siege. 2. In 2013 Putin was the most popular politician (more than Obama) and that was in the year that his P Moon was in the same degree as N Moon (and OOB). Oscar Pistorius is another example with an OOB Moon in Leo and progressed OOB Moon in 2013 (year of the killing of his friend) PAST the top position.